Football hooligans clash inside stadium as Bristol City and Swansea yobs surge towards each other to trade blows, London's SUN said in a headline on Saturday. The tabloid said Swansea and Bristol City fans swapped punches inside Ashton Gate during the Championship game. 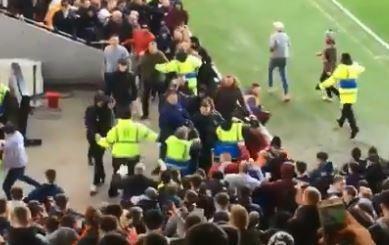 Trouble erupted just 18 minutes into the game when a large group of Swansea fans poured into the ground, according to reports. The away fans are said to have goaded the home supporters as they entered. Bristol Live reporter Gregor MacGregor, who witnessed the trouble, said: "It's kicking off in the corner of the Atyeo Stand and the Dolman. A large group of Swans fans arrived at about 18 minutes and goaded the home fans. "In response a load of City fans moved down to the corner of the Dolman Stand to get close to the Swansea supporters. Several fans made their way over and started throwing punches." Cops confirmed one person had been arrested on assault charges although the Avon and Somerset Police are continuing to investigate. Bristol City declined to comment when approached by The Sun Online. The Sun Online has attempted to contact Swansea City for comment.